Final exams. Most high schools have been giving them for generations. Late night study sessions or all nighters, stress, moodiness – all part of the experience. Most of us go through it. It seems coddling to these kids has been taken to a whole new level at my boys high school this year. Recognizing these poor babies have to deal with finals (boo hoo) the school has brought in…stress dogs – dogs that the kids can hug and pet to help them get relief from the stress of finals. 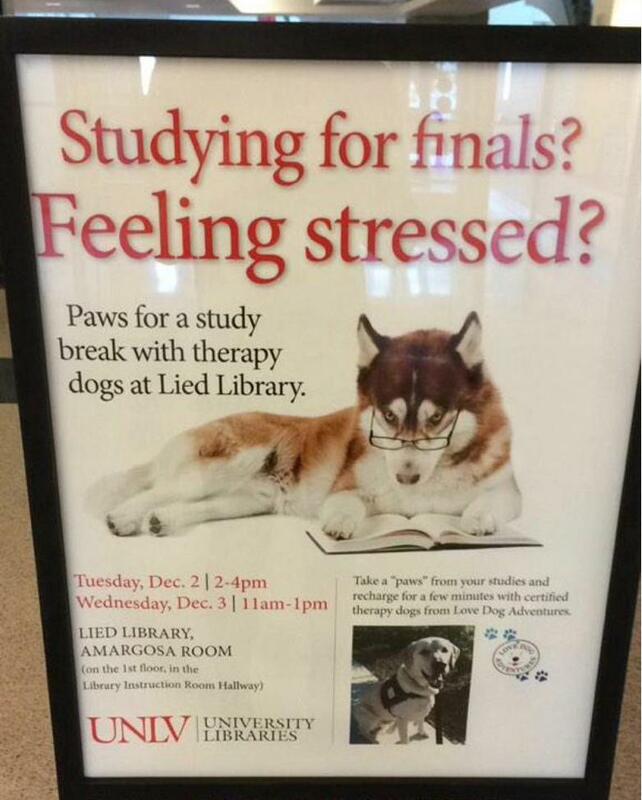 And to think all we had to deal with stress of finals when I was in high school was…never mind. Last week we went back to basics and reviewed the difference between and American and European option. We then went over the basics of a call. Today lets continue on with puts. As we remember from last week calls give the owner the right to buy an underlying at a specific price over a specific time. For the call owner, calls are a bullish bet. Puts on the other hand give the owner the right to sell an underlying at a specific price over a specific time. For example, if I own the AAPL Feb 95 put I have the right (not the obligation) to sell AAPL at $95 between now and February expiration (Feb 19). No matter what happens to the stock, the owner has the right to sell AAPL at $95 over the next 30 days. Puts are used by folks who are either bearish on the stock or own the stock and want some protection against a downside move. The seller of the put has the obligation to buy AAPL at $95 whenever he is assigned between now and expiration. The seller is paid the price of the put to take on this obligation. The only way to avoid the obligation is to buy back his short put position. So now that we understand calls and puts, let’s review some basic terminology. Options can be either in the money, out of the money or at the money. In the money options are when the strike price is either above (puts) or below (calls) the stock price. For example IBM 100 calls are in the money if the stock is $105. In this case the calls are in the money by $5 – they are intrinsically worth $5. The owner could exercise his calls and buy the stock for $100 and sell it in the market for $105. IBM 110 calls are out of the money – the owner would not exercise his right to buy IBM at $110 since that price is above the market price of $105. The AAPL 95 put is in the money when that strike is above the price of the stock since a put is the right to sell the stock at the strike price. In this case with AAPL at $91, the put is $4 in the money. If the stock is trading at $100, the 95 puts are out of the money since the owner would not exercise to sell stock at $95 when the stock is trading higher in the open market. Finally if a stock price is the same as the strike price, the strike is said to be at the money. IBM 100 calls are at the money with IBM trading at $100 and AAPL 95 puts are at the money with AAPL trading at $95. Next week: intrinsic and extrinsic value and volatility.